Osteoporosis occurs when bones lose minerals, such as calcium, more quickly than the body can replace them, leading to a loss of bone thickness (bone mass or density). As a result, bones become thinner and less dense, so that even a minor bump or accident can cause serious fractures. These are known as fragility or minimal trauma fractures. Any bone can be affected by osteoporosis, but the most common sites are bones in the hip, spine, wrist, ribs, pelvis and upper arm. Osteoporosis usually has no signs or symptoms until a fracture happens – this is why osteoporosis is often called the ‘silent disease’. Fractures due to osteoporosis (osteoporotic fractures) can lead to changes in posture (eg developing a stoop or Dowager’s hump in your back), muscle weakness, loss of height and bone deformity of the spine. Fractures can lead to chronic pain, disability, loss of independence and even premature death. Every 8 minutes, someone is admitted to an Australian hospital with an osteoporotic fracture. This is expected to rise to every 3 – 4 minutes by the year 2021, as the population ages and the number of osteoporotic fractures increase. 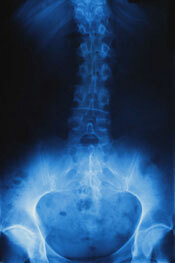 About 50% of people with one fracture due to osteoporosis will have another. The risk of future fractures rises with each new fracture, the ‘cascade effect’. The ‘cascade effect’ means that women who have suffered a fracture in their spine are over 4 times more likely to have another fracture within the next year, compared to women who have never had an osteoporotic fracture. People who have had two or more osteoporotic fractures are up to 9 times more likely to have another fracture, rising to an 11 times greater risk for people who have had three or more fractures, compared to someone who has not had one. Two thirds of fractures of the spine are not identified or treated, even though they nearly all cause pain and some disability. Often people believe that the symptoms of spine fracture ¬ back pain, height loss or rounding of the spine are just due to ‘old age’. However, for many people, osteoporotic fractures can be prevented, or at least your risk of having further fractures greatly reduced.